Succulenta, Netherlands, 74e (1):38-44 (3) 1995. Basionym: Sclerocactus pubispinus (Engelmann) Woodruff & L. Benson var.sileri L.Benson Cacti of Arizona, ed.3, 23, 179, 1969. Holotype: House Rock Valley, Arizona, fieldnumber, fh 52.1, 27. November 1994 HBG. 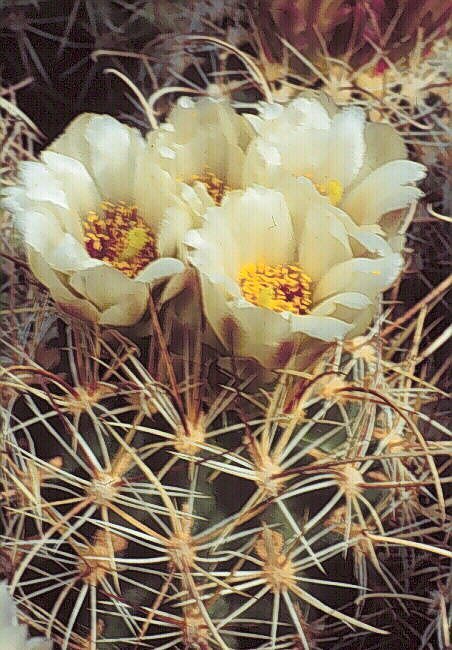 Sclerocactus sileri (L. Benson) Heil & Porter Haseltonia, 2, 20-46, 1994. Type: Siler s.n. (F).1888. Southern Utah Ph. Isotype (US). fh 52.7, Corall Valley, 1,800 m.
Sclerocactus whipplei ssp.busekii, fh 52.1, House Roack Valley, AZ.